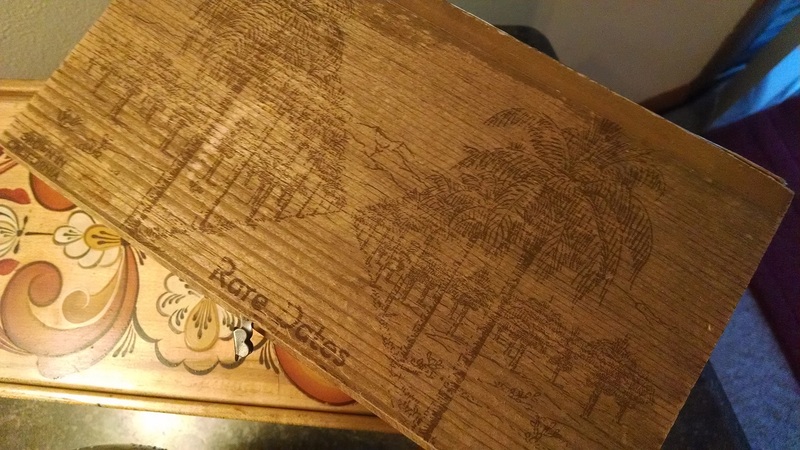 A wooden box. I had never seen this wooden box before. I wondered what was inside and three seconds later, it was open. I stared at it for half a minute and then a smile placed itself on my heart. 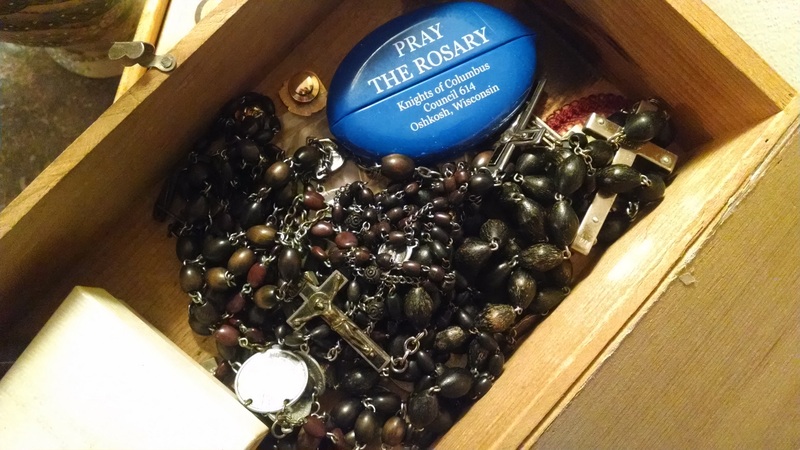 Dad had kept a collection of rosaries, a St. Christopher medal, and a blue plastic coin purse that obviously came from years of affiliation with the Knights of Columbus, a Catholic fraternal service organization. Of all his personal possessions, I had a feeling this meant the most to him. Dad was Catholic. My brother and I were baptized in the church as babies and spent our formative years living through Latin masses and driving for miles on a Sunday, while on vacation, to find the nearest Catholic church. Mom and dad (and the kids) never missed church…because you could not miss church unless you were half dead with illness or lost on the back roads of northern Wisconsin. I didn’t understand the fuss of church as a child. As an adult, though, I understood the strength of dad’s faith in that box. That box contained his treasured beads, his commitment to faith and love of his God. For other bloggers’ treasures, click here. Thanks and yes, he was. I’m sure you must be thinking of your dad often, considering the loving words you have for him. I lost mine last summer and like you I found that some of his personal belongings were telling me stories of him that I didn’t know. Thank you for sharing this private moment with us. I’m sorry your dad has passed, but glad that you have learned more about him through those possessions. I do think of my dad often and try to keep his voice and memory strong. I totally get this. I expect to find at least one of these when MTM’s mom is gone. I hope that’s not for awhile, Andra. So sweet, Mary. I’m glad you got to see this and to have a deeper understanding of your Dad’s treasures. Thank you for sharing them with us! You’re welcome Cathy. Dad’s treasure has now become mine and a wonderful reminder of him. what a beautiful post. I grew up Catholic, also, and my dad was a Knight. What memories this brought back. Every month a pancake breakfast after Mass put on by the Knights of Columbus. Thank you! Pancakes after mass? That’s awesome! Cheers back to you and thank you so much for your comments. This is a beautiful post, and what a lovely keepsake for your family. Yes, it is a wonderful treasure! It felt sweet at the moment, and I’m glad that he kept it so that I could find it.